Gray, red, and brown on body; white and gray on belly. 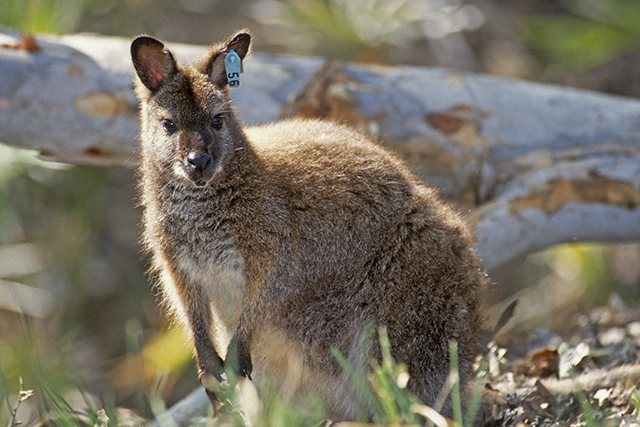 Australian populations have short, coarse fur. Tasmanian populations have longer, shaggy fur. Stable. Very common in Tasmania. Mixture of decreasing and increasing populations in mainland Australia. Two- and four-legged hopping; sometimes use tail as a "fifth support limb." Good swimmers; doggie paddle. Active at night, dawn, and dusk. Daytime hours spent resting. Found singly or in small groups; often solitary. Primarily, grasses, leaves, forbs. Some fruit, ferns, and fungi. Often feed in high elevation areas. Another birth occurs 16-29 days after the young permanently leaves the pouch. © 2011-2018 San Diego Zoo Global. Population and Conservation Statuses updated April 2018.